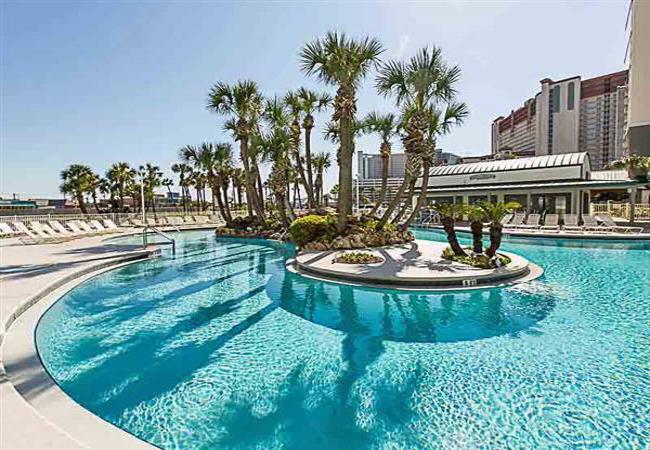 Located along 1,300 feet of beautiful emerald waters and white sandy beaches, Long Beach Resort Condo Rentals entices guests with the most breathtaking waterfront views. Oversized balconies in this Panama City Beach resort invite guests to revel in the refreshing sea breezes and breathe the fresh salt air. At sea level, both the Gulf and the tropical lagoon pool serve to cool guests off after a day of sunbathing on the pristine beach. Enjoy the poolside fare at The Hangout, where a variety of sandwiches, snacks, and beverages are available throughout the day. Push the “1” on the elevator and in a snap you’re facing wonderful choices – lagoon pool or beach. Or maybe some tennis on one of the lighted courts. Or hangout at The Hangout. And if it’s a little nippy out at night, the pools are heated and so are the whirlpools. Long Beach Resort is a truly unique destination and one of the many other Panama City Beach resorts we manage. This is a place you can come and never have to leave. A place that will be a great backdrop for your best vacation.